Alviso, CA Saxophone Lessons Near Me | Fun Classes. Top Teachers. I've been teaching saxophone for 20 years and my students have gone on to the State level Band Auditions and won multiple times. Within the first few lessons, you'll be able to make a decent sound, play scales, arpeggios and simple tunes, and as time goes on you'll be able to play popular tunes solo and with accompaniment of piano or band. I specialize in classical, jazz and klezmer style, typically use best published books, and have the renovated, quiet and spacious studio, music stands, audio equipment. I love working with students of all ages and experience levels and I can't wait to meet you! I have been teaching saxophone lessons to students of all abilities for five years, and I have been playing the saxophone for thirteen years. I teach both classical and jazz, and I cater my lesson plans to the specific needs, goals, and learning styles of every student. I have studied with Taimur Sullivan and Timothy McAllister during my undergraduate years at the Bienen School of Music. 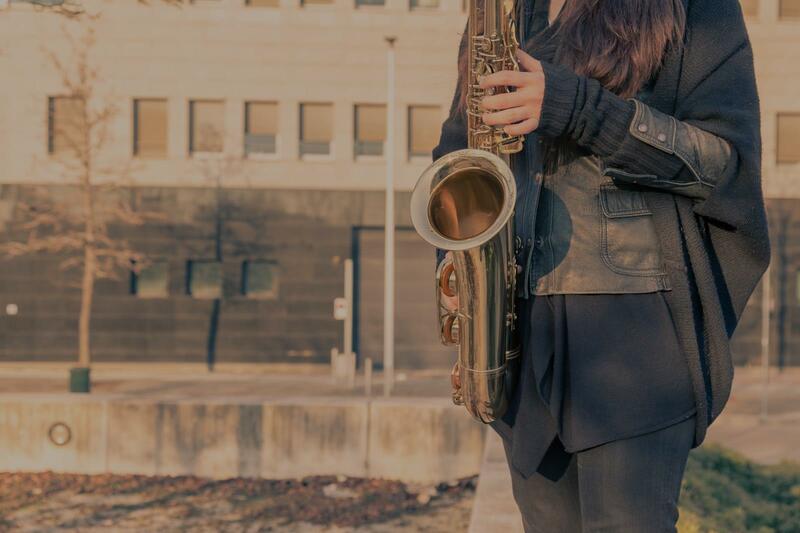 I recently represented Illinois in the MTNA Young Artist Competition and was one of 25 young saxophonists in North America to be selected for the semifinals of their Collegiate Solo Competition. I am able to teach instrument fundamentals, repertoire, sight reading, music theory, ear training, basics of improvisation, and much more. I look forward to working with you! Aidan is a classical saxophonist and music educator. He has performed in venues across the United States as a concerto soloist, chamber musician, and ensemble member. In only his second year of undergraduate study, he was named the Winner of the 2015 Illinois Young Artist Woodwind Performance Competition through the Music Teachers National Association (MTNA). He went on to be named the Honorable Mention in the East Central Division round. For two consecutive national conferences (2016, 2018) organized by the North American Saxophone Alliance (NASA), he was selected as one of twenty-five young saxophone soloists to perform and compete in the Semifinals. rles, and Nikita Zimin. Finally, he has taken supplementary lessons from Vincent David, Carrie Koffman, Chien-Kwan Lin, Otis Murphy, Zachary Shemon, and Kenneth Tse. Since 2014, he has maintained a private saxophone studio of his own, helping area students improve their craft. He has been able to quickly pinpoint opportunities for improvement and learning, and effectively communicates those ideas in frameworks suited for the age and ability of each student. His students have been accepted into collegiate music schools across the United States. He has performed world premieres and is working on the collaborative development of new creative projects. Aidan has been a member of the North American Saxophone Alliance (NASA) since 2015 and recently participated in the American Saxophone Academy (ASA). Aidan was a great instructor for our beginning sax players. He was very flexible with our family schedule, had a nice manner with the kids and they learned a great deal. We highly recommend Aidan! Aidan is by far the best teacher i’ve had. He gives excellent input and is very knowledgeable! I 100% recommend him! I focus on making sounds from the instrument and getting the basics of wetting the reed, using just the mouth piece, and demonstrating different capabilities and sounds from my own playing. Once the basics are learned I move on to simple pieces together and get them used to hearing melodies through the saxophone.